A mere block away from Kaplan’s office in Brookline, Mass., the project team didn’t have to travel far to get to the Bright Horizons job site. Over the course of four months and following a complete demolition of the building interior, Kaplan renovated an existing office building located at 138 Harvard Street in Brookline into a new early education and preschool that can accommodate up to 113 children ranging from infants to pre-kindergarten. 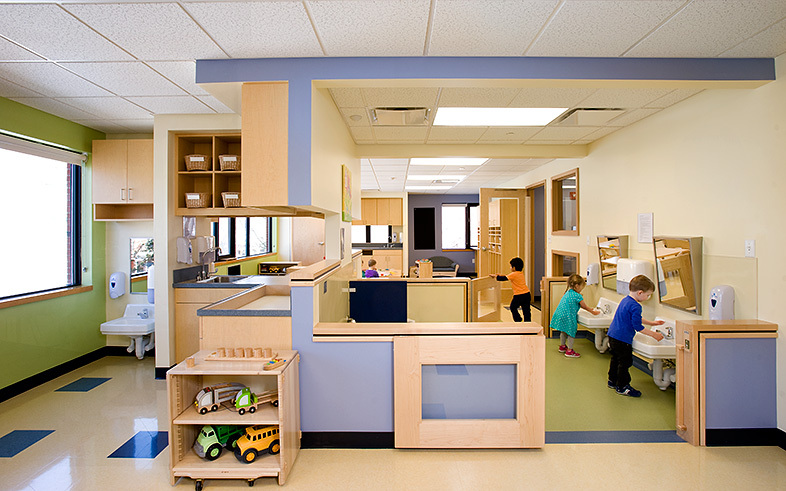 In addition to the classrooms organized by age group, Kaplan created an interior playroom with a climbing wall as well as a staff lounge, kitchen area, and office space for employees. The parking area, located underneath the stilted building, was converted into green space and a playground with rubber surfacing and artificial turf. A concrete tricycle path with bridges and tunnels was incorporated into the play area. A perimeter fence was installed along Harvard Street and Auburn Street, and low interior fences were constructed to separate the different age groups. A new roof and mechanical systems were installed and a 140-foot long ramp was constructed to provide an evacuation route from the center to the exterior. In 2014, Kaplan was commissioned to build a second location for Bright Horizons in Newton, bringing a vibrant atmosphere to a part of town that is mostly retail and office space. The education center, which accommodates up to 106 children ranging from infants to pre-kindergarten, opened in May 2015. In 2016, Kaplan was brought on again to manage renovations for two new centers in Natick and Kendall Square in Cambridge. This fast-track project went smoothly from start to finish thanks to Kaplan Construction. They understand the restrictions of working in Brookline and they did a great job. We now have a bright and friendly space to support the early education and child development for our families.